The best-selling book series “Diary of a Wimpy Kid” by Jeff Kinney which won at the recent Nickelodeon’s Kids’ Choice Awards over the “Harry Potter” and “Twilight” series is now a major motion picture from 20th Century Fox. From the pages of the best-selling book series, the “Diary of a Wimpy Kid” movie reels on Greg Heffley (played by Zachary Gordon) thinking middle school is the dumbest idea ever invented. For him, middle school is filled with oodles of morons and worst, bullies. As Greg tries to survive the never-ending ordeal and attain the recognition and status he feels he so richly deserves, he devises an endless series of his daily mischief by penning it on paper. His diary as his mother calls it and that which Greg prefers to be called journal is filled with his ideas, judgment and stories of family and school ordeals that serves as his gateway for magnified emotions and ideals of a teen trying to fit in and prove something. Jeff Kinney also serves as a consultant all throughout the movie’s production. He defines his anti-hero, Greg as a “deeply flawed character but likeable.” During the course of the production, Kinney stresses the importance of preserving Greg’s voice, which he characterizes as a balance of cockiness and powerlessness. “I pushed for him to be a likeable jerk. One of my favorite things is Greg doesn’t learn his lesson all the time,’ explains Kinney. Greg "is pretty lazy, so I have to act like that," Zachary continues. "I have to act competitive and really self-centered. By reading the books and thinking about Greg … he always thinks everything revolves around him. He thinks the world is just about him." While some are raising their eyebrows on Greg’s character, Zachary has just but a few words of (youngster’s) wisdom to enlighten the cynical: “Everybody has Greg inside him. Their worst parts are him. That's how they relate to him, and he also has a little bit of a conscience, in some ways." The movie is directed by Thor Freudenthal whose credits include the kiddie films “Hotel for Dogs,” “The Haunted Mansion” and “Stuart Litte 1 and 2.” It also stars an outrageous cast of comedic talents Steve Zahn, Rachael Harris, Chole Grace Moretz, Devon Bostick and Robert Capron. 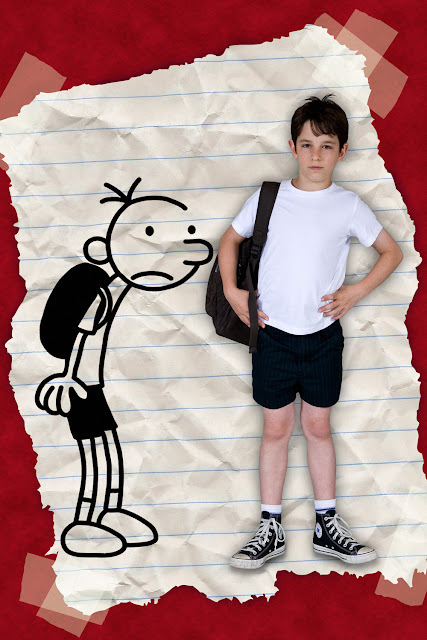 “Diary of A Wimpy Kid” opens April 3 (Black Saturday) in theaters from 20th Century Fox to be distributed by Warner Bros.